Develop the skills you'll need on the job-from organizing patient care and motivating staff to managing conflict and working collaboratively-with this new edition of the #1 best-selling Leadership & Management book. 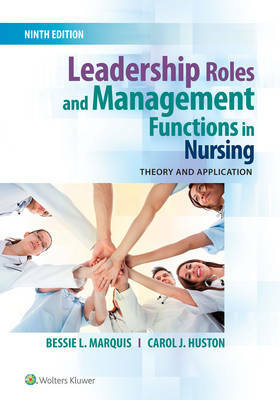 Leadership Roles and Management Functions in Nursing covers the symbiotic elements of leadership and management, with an emphasis on problem solving and critical thinking. This ninth edition balances strong coverage of leadership and management concepts with a variety of real-world scenarios in the experiential learning exercises throughout the book, which is critical when learners often have limited first-hand opportunity to observe high performing middle- and top-level managers in nursing practice. Unit I provides a foundation for the decision-making, problem-solving, and critical-thinking skills, as well as management and leadership skills needed to address the management-leadership problems presented in the text. Unit II covers ethics, legal concepts, and advocacy, which we see as core components of leadership and management decision making. The remaining units are organized using the management processes of planning, organizing, staffing, directing, and controlling. This edition is our most illustrated yet, and photographs have been added to reinforce learning for visual learners and so the textbook is an easier, more engaging read for students new to the subject matter while still retaining the rigor that students need to be practice-ready. Aligning with the textbook's active learning approach that encourages students to take their learning beyond basic knowledge acquisition, we have improved our instructor testbank to feature more questions at the higher level of Bloom's Taxonomy.